We have an old Wesco furnace circa 1979ish. Trying to install a Sensi touch screen thermostat. I had no problem taking the mercury thermostat off the wall and finding extra wires behind. When crawling under the house, I cannot figure out where I should be connecting the wire of the same color for the common wire. The cream color and red wires are the same as the two on the thermostat upstairs. Orange or sometimes purple is the reversing valve on heat pumps. DIYers get them mixed up all the time. If they are, you might have to trace them and figure it out. Spent many a service call doing that. It appears that you have old 2-wire thermostat wire. If so, I suspect it's not going to be compatible with the new thermostat. 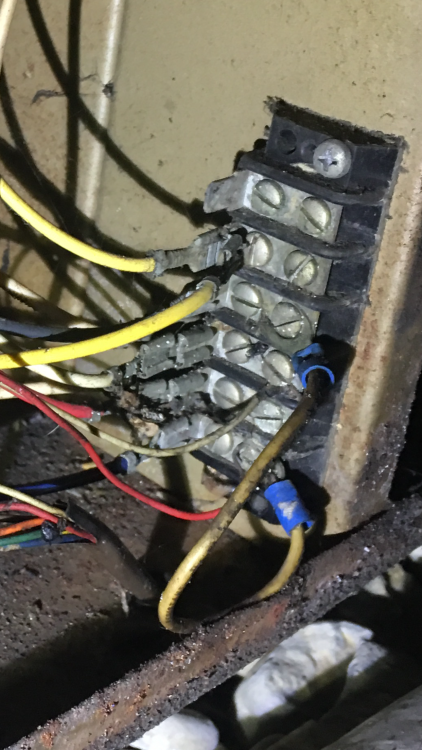 A 24 volt transformer may be needed. Look at the install directions for using old 2 wire thermostat wire. It's going to be tricky to figure out. You're also going to want to install the green wire to get control of the blower. Take a picture of the schematic and post it here. You'll find the schematic pasted to the back of the furnace door. Jim, unfortunately there wasn’t a schematic or I definitely would have posted it. I couldn’t even find the model number. Did you remove the metal panel that covers the electrical compartment? It's usually held in place by two or three hex-head screws. You might find a schematic pasted to the back of that cover.